There are things they want to do inside their own minds. In a time when travel was by horseback and sailing ship, Masonry spread with amazing speed. By 1731, when Benjamin Franklin joined the fraternity, there were already several lodges in the Colonies, and Masonry spread rapidly as America expanded west. In addition to Franklin, many of the Founding Fathers men such as George Washington, Paul Revere, Joseph Warren, and John Hancock were Masons. Masons and Masonry played an important part in the Revolutionary War and an even more important part in the Constitutional Convention and the debates surrounding the ratification of the Bill of Rights. Many of those debates were held in Masonic lodges. The word lodge means both a group of Masons meeting in some place and the room or building in which they meet. Masonic buildings are also sometimes called temple because much of the symbolism Masonry uses to teach its lessons comes from the building of King Solomon's Temple in the Holy Land. The term you've itself comes from the structures which the stonemasons built against the sides of the cathedrals during construction. In winter, when building had to stop, they lived in these lodges and worked at carving stone. If you have ever watched C-Spans' coverage of the House of Commons in London, you'ii notice that the layout is about the same. Since Masonry came to America from England, we still use the English floor plan and English titles for the officers. The Worshipful Master of the Lodge sits in the East (Worshipful is an English term of respect which means the same thing as Honorable.) He is called the Master of the lodge for the same reason that the leader of an orchestra is called the Concert Master. It's simply an older term for Leader. In other organizations, he would be called President. The Senior and Junior Wardens are the First and Second Vice-Presidents. The Deacons are messengers and the Stewards have charge of refreshments. Every lodge has an altar holding a Volume of the Sacred Law. In the United States and Canada, that is almost always a Bible. Masonry teaches that each person has a responsibility to make things better in the world. Most individuals won't be the ones to find a cure for cancer, or eliminate poverty, or help create world peace, but every man and woman and child can do something to help others and to make things a little better. Masonry is deeply involved with helping people it spends more than $1.4 million dollars every day in the United States, just to make life a little easier. And the great majority of that help goes to people who are not Masons. Some of these charities are vast projects, like the Crippled Children's' Hospitals and Burns Institutes built by the Shriners. Also, Scottish Rite Masons maintain a nationwide network of over 100 Childhood Language Disorders Clinics, Centers, and Programs. Each helps children afflicted by such conditions as aphasia, dyslexia, stuttering, and related learning or speech disorders. Some services are less noticeable, like helping a widow pay her electric bill or buying coats and shoes for disadvantaged children. And there is just about anything you can think of in-between. But with projects large or small, the Masons of a lodge try to help make the world a better place. The lodge gives them a way to combine with others to do even more good. Masonry does things Grow the individual Mason. Grow or die is a great law of all nature. Most people feel a need for continued growth and development as individuals. They feel they are not as honest or as charitable or as compassionate or as loving or as trusting as they ought to be. Masonry reminds its members over and over again of the importance of these qualities. It lets men associate with other men of honor and integrity who believe that things like honesty and compassion and love and trust are important. In some ways, Masonry is a support group for men who are trying to make the right decisions. It's easier to practice these virtues when you know that those around you think they are important, too, and won't laugh at you. That's a major reason that Masons enjoy being together. For members only, two basic kinds of meetings take place in a lodge. The most common is a simple business meeting. To open and close the meeting, there is a ceremony whose purpose is to remind us of the virtues by which we are supposed to live. Then there is a reading of the minutes; voting on petitions (applications of men who want to join the fraternity); planning for charitable functions, family events, and other lodge activities; and sharing information about members (called Brothers, as in most fraternities) who are ill or have some sort of need. The other kind of meeting is one in which people join the fraternity one at which the degrees are performed. But every lodge serves more than its own members. Frequently, there are meetings open to the public. Examples are Ladies Nights, Brother Bring a Friend Nights, public installations of officers, Cornerstone Laying ceremonies, and other special meetings supporting community events and dealing with topics of local interest. Masons also sponsor Ladies groups such as The Order of Eastern Star and Amaranth, and Youth Groups such as Triangle, Rainbow, Constellation, Job's Daughters; for girls, and Order of DeMolay for Boys. A degree is a stage or level of membership. It's also the ceremony by which a man attains that level of membership. There are three, called Entered Apprentice, Fellow craft, and Master Mason. As you can see, the names are taken from the craft guilds. In the Middle Ages, when a person wanted to join a craft, such as the gold smiths or the carpenters or the stonemasons, he was first apprenticed. As an apprentice, he learned the tools and skills of the trade. When he had proved his skills, he became a Fellow of the Craft (today we would say Journeyman), and when he had exceptional ability, he was known as a Master of the Craft. The Masonic degrees teach the great lessons of life the importance of honor and integrity, of being a person on whom others can rely, of being both trusting and trustworthy, of realizing that you have a spiritual nature as well as a physical or animal nature, of the importance of self-control, of knowing how to love and be loved, of knowing how to keep confidential what others tell you so that they can open up without fear. It isn't secretive, although it sometimes has that reputation. Masons certainly don't make a secret of the fact that they are members of the fraternity. We wear rings, lapel pins and tie tacks with Masonic emblems like the Square and Compasses, the best known of Masonic signs which, logically, recalls the Fraternity's roots in stone masonry. Masonic buildings are clearly marked, and are usually listed in the phone book. Lodge activities are not secret picnics and other events are even listed in the newspapers, especially in smaller towns. Many lodges have answering machines which give the upcoming lodge activities. But there are some Masonic secrets, and they fall into two categories. The first are the ways in which a man can identify himself as a Mason grips and passwords. We keep those private for obvious reasons. It is not at all unknown for unscrupulous people to try to pass themselves off as Masons in order to get assistance under false pretenses. 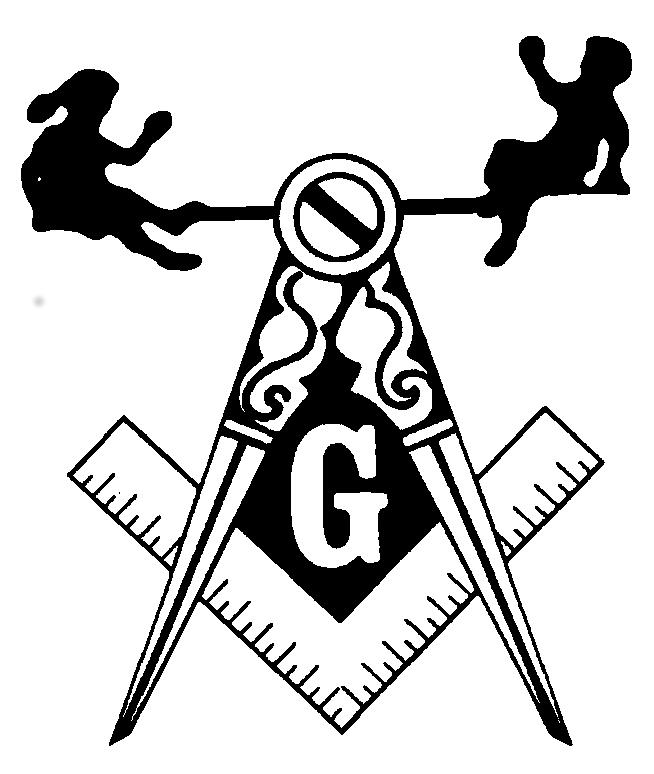 The second group is harder to describe, but they are the one's Masons usually mean if we talk about Masonic secrets. They are secrets because they literally can't be talked about, can't be put into words. They are the changes that happen to a man when he really accepts responsibility for his own life and, at the same time, truly decides that his real happiness is in helping others. It's a wonderful feeling, but it is something you simply can't explain to another person. That's why we sometimes say that Masonic secrets cannot ( rather than may not) be told. Try telling someone exactly what you feel when you see a beautiful sunset, or when you hear music, like the national anthem, which suddenly stirs old memories, and you'ii understand what we mean. Secret Societys became very popular in America in the late 1800s and early 1900s. There were literally hundreds of them, and most people belonged to two or three. Many of them were modeled on Masonry, and made a great point of having many secrets. And Masonry got ranked with them. But if Masonry is a secret society, it is the worst-kept secret in town. We do use ritual in the meetings, and because there is always an altar or table with the Volume of the Sacred Law open if a lodge is meeting, some people have confused Masonry with a religion, but it is not. That does not mean that religion plays no part in Masonry it plays a very important part. A person who wants to become a Mason must have a belief in God. No atheist can ever become a Mason. Meetings open with prayer, and a Mason is taught, as one of the first lessons of Masonry, that one should pray for divine counsel and guidance before starting an important undertaking. But that does not make Masonry a religion. Sometimes people confuse Masonry with a religion because we call some Masonic buildings temples. But we use the word in the same sense that Justice Oliver Wendell Holmes called the Supreme Court a Temple of Justice and because a Masonic lodge is a symbol of the Temple of Solomon. Neither Masonry nor the Supreme Court is a religion just because its members meet in a temple. In some ways, the relationship between Masonry and religion is like the relationship between the Parent Teacher Association (the P.T.A.) and education. Members of the P.T.A. believe in the importance of education. They support it. They assert that no man or woman can be a complete and whole individual or live up to his or her full potential without education. They encourage students to stay in school and parents to be involved with the education of their children. They may give scholarships. They encourage their members to get involved with and support their individual schools. Masonry uses a ritual because it is an effective way to teach important ideas the values we.ve talked about earlier. And it reminds us where we are, just as the ritual of a business meeting reminds people where they are and what they are supposed to be doing. Masonry ritual is very rich because it is so old. It has developed over centuries to contain some beautiful language and ideas expressed in symbols. But there is nothing unusual in using ritual. All of us do it every day. Everyone uses symbols every day, just as we do ritual. We use them because they communicate quickly. When you see a stop sign, you know what it means, even if you can't read the word stop. The circle and line mean don't or do not allowed. In fact, using symbols is probably the oldest way of communication and the oldest way of teaching. Masonry uses symbols for the same reason. Some form of the Square and Compasses is the most widely used and known symbol of Masonry. In one way, this symbol is a kind of trademark for the fraternity, as the Golden Arches are for McDonalds. When you see the Square and Compasses on a building, you know that Masons meet there. The Square symbolizes things of the earth, and it also symbolizes honor, integrity, truthfulness, and the other ways we should relate to this world and the people in it. The Compasses symbolize things of the spirit, and the importance of a well-developed spiritual life, and also the importance of self-control of keeping ourselves within bounds. The G stands for Geometry, the science which the ancients believed most revealed the glory of God and His works in the heavens, and it also stands for God, Who must be at the center of all our thoughts and of all our efforts. Yes. In a very real sense, education is at the center of Masonry. We have stressed its importance for a very long time. Back in the Middle Ages, schools were held in the lodges of stonemasons. You have to know a lot to build a cathedral geometry, and structural engineering, and mathematics, just for a start. And that education was not very widely available. All the formal schools and colleges trained people for careers in the church, or in law or medicine. And you had to be a member of the social upper classes to go to those schools. Stonemasons did not come from the aristocracy. And so the lodges had to teach the necessary skills and information. Freemasonry's dedication to education started there. Each person must learn and practice self-control. Each person must make sure his spiritual nature triumphs over his animal nature. Another way to say the same thing is that even when we are tempted to anger, we must not be violent. Even when we are tempted to selfishness, we must be charitable. Even when we want to write someone off, we must remember that he or she is a human and entitled to our respect. Even when we want to give up, we must go on. Even when we are hated, we must return love, or, at a minimum, we must not hate back. It isn't easy! It is important to work to make this world better for all who live in it. Masonry teaches the importance of doing good, not because it assures a person's entrance into heaven that's a question for a religion, not a fraternity but because we have a duty to all other men and women to make their lives as fulfilling as they can be. The person who wants to join Masonry must be a man (it is a fraternity), sound in body and mind, who believes in God, is at least the minimum age required by Masonry in his state, and has a good reputation. (Incidentally, the sound in body requirement which comes from the stonemasons of the Middle Ages doesn't mean that a physically challenged man cannot be a Mason; many are). Some men are surprised that no one has ever asked them to become a Mason. They may even feel that the Masons in their town don't think they are good enough to join. But it doesn't work that way. For hundreds of years, Masons have been forbidden to ask others to join the fraternity. We can talk to friends about Masonry, we can tell them about what Masonry does. We can tell them why we enjoy it. But we can't ask, much less pressure anyone to join. There a good reason for that. It isn't that we're trying to be exclusive. But becoming a Mason is a very serious thing. Joining Masonry is making a permanent life commitment to live in certain ways. We've listed most of them above to live with honor and integrity, to be willing to share and care about others, to trust each other, and to place ultimate trust in God. No one should be talked into making such a decision. So, when a man decides he wants to be a Mason, he asks a Mason for a petition or application. He fills it out and gives it to the Mason, and that Mason takes it to the local lodge. The Master of the lodge will appoint a committee to visit with the man and his family, find out a little about him and why he wants to be a Mason, tell him and his family about Masonry, and answer their questions. The committee reports to the lodge, and the lodge votes on the petition. If the vote is affirmative and it usually is the lodge will contact the man to set the date for the Entered Apprentice Degree. When the person has completed all three degrees, he is a Master Mason and a full member of the fraternity. Many men over many generations have answered the question, What is a Mason? One of the most eloquent was written by the Reverend Joseph Fort Newton, an internationally honored minister of the first half of the 20th Century. When he can be happy and high-minded amid the meaner drudgery's of life.